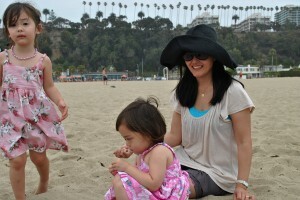 You are currently browsing the Elisabeth Shim, MD blog archives for July, 2012. Sorry I have not blogged in a while. Been so busy. Getting ready to move to our (not so) new house in the next few months amongst putting out fires at the office and at home constantly is taking away my free time. Many of my patients request to see photos of my kids, which is so sweet. Unfortunately, I forget at the end of the visits. These photos were taken on Father’s Day. My dear hairdresser and friend Katja had her daughter’s bday at Annenberg Beach House, and it was a nice relaxing time. I especially enjoyed the wonderful German beet salad. My best friend when I was really young was Austrian, so German culture and food seems strangely familiar. Too bad ich habe alles vergessen (my Deutsch, that is…took 3 years of it in high school). We’re in the midst of obtaining electronic medical records which is driving the whole office slightly insane. Also in the middle of redoing the waiting room (pardon the mess), amongst other things.